At 9:46 PM PST on March 10, an 8.9 magnitude earthquake hit approximately 125km off the eastern coast of Japan (Honshu) at a depth fo 10km, causing a 4 meter high tsunami to hit the coastal areas of Japan. Huge areas of the coast are literally being washed away. 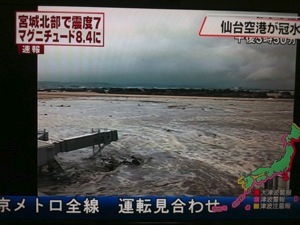 Sendai airport is literally flooded (pic). In Tokyo the quake appears to have caused minimal damage (mostly shaking buildings, frayed nerves and things falling off shelves, that sort of thing, although there are a few fires). But train and subway service is stopped. The government has called an emergency meeting. Twitter is once again proving to be a great source of coverage, and once again shows the power of social networking during times of crisis. Some online streaming coverage (in English) is coming courtesy of Anime Expo Live and Yokoso News. Additional sources of coverage include the English Al Jazeera (note this is NOT the same as the Muslim Al Jazeera propaganda machine), and these two Ustream streams. I’ll update this post with more information when I can. Our thoughts and prayers go out to everyone in Japan and elsewhere that are affected by this terrible disaster.